Honey Mustard Chicken Salad. This easy to put together salad is bursting with flavor. Plus it's hearty enough to be a complete meal for dinner and leave you fully satisfied. 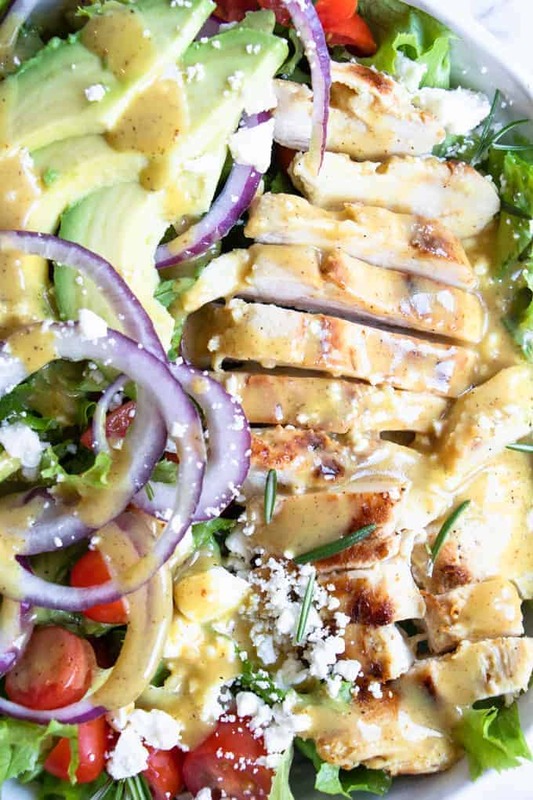 The honey mustard vinaigrette comes together with pantry items, and it doubles as the chicken marinade AND the salad dressing! Making this a quick and easy meal prep or weeknight dinner recipe! Add the chicken breasts to a large resealable plastic bag or sealed container. Add ¼ cup of the honey mustard marinade to coat the chicken. Seal and refrigerate to marinate the chicken for at least 2 hours. Cover and refrigerate the remaining vinaigrette. When ready to prep the salad, heat a large skillet over medium heat, drizzle a small amount of extra virgin olive oil in the skillet. Add the chicken breasts. Cook on each side about 8 minutes, until the chicken is cooked through and shows 165 on a digital thermometer. Remove the chicken to a cutting board. Prepare the remaining salad ingredients. Slice the chicken as desired for the salad. Add all ingredients to create a salad and drizzle with the remaining honey mustard vinaigrette. The ingredients and the vinaigrette makes enough for 2 large salads.